The whole point of this project is, of course, the controls. To get the feel of a genuine arcade joystick in your hand, to spin a trackball madly across the screen dodging laser beams, to slam your hand down a hundred times a minute on the fire button trying to do unto them before they do unto you. Arcade controls can be gotten from at least four different sources that I know of. Arcade supply houses, scavenging parts from old arcade equipment, building your own from scratch, or (more recently) pre-made components from vendors that you can plug into your project. Dann's Build Your Own Detachable Steering Wheel! There are two main variations of arcade buttons, the microswitch, and the leaf design. The leaf design is generally accepted as the better feeling button, but is harder to maintain. The mechanism beneath the button can get out of alignment, resulting in dead buttons, and is difficult to re-align. The microswitch style buttons have a slightly stiffer feel than leaf buttons, but are less prone to dead button syndrome. Microswitch buttons also make a click sound every time they are pressed, while leaf buttons do not. It is also more difficult to find leaf style buttons anymore. Happ Controls has a wide selection of microswitch arcade buttons as do Ultimarc, while some people have reported being able to obtain leaf buttons from Wico. There are also two different kinds of microswitch pushbuttons - vertical, and horizontal. Usually you'll find horizontal, but vertical pushbuttons are out there too. Which to use? This message from matt(v) convinces me horizontal is the way to go. There seems to be a pretty major design flaw in all the vertical microswitch designs that I have seen. A pushbutton is made of two pieces of plastic, barrel and plunger (these are just my descriptions of the parts, don't go asking an arcade operator for a replacement plunger, you'll look like a fool) Anyway the barrel clips inside the plunger and has two plastic prongs sticking out the bottom. One of these prongs is in contact with the actuator on the microswitch . When you push the pushbutton the barrel moves down and closes the switch, here is where the difference between the two switch orientations comes in. For a horizontal microswitch the prong off the bottom of the plunger pushes straight down on top of it, I guess if you hit the button with a hammer you could cause some damage to the microswitch below but for the most part this arrangement seems to work well. The pushbutton was so badly made in the first place that there is room for the plunger to move side to side in the barrel rather than just up and down, if you don't hit the button dead centre the prong goes right past the actuator without closing the switch. That about sums it up nicely. Thanks matt(v)! There are so many different models of joysticks that discussing a preference with someone is almost like a religious debate. We'll let you decide which one's the best, but there are several factors to consider. This discusses mostly Happ Controls joysticks, but similar sticks are often available from Wico. Ultimarc also sell a range of joysticks which they reckon are specifically geared towards emulation and all have a mechanical 4-8 way switchover, which have been getting good comments from the BYOAC community. Aside from the information here, joysticks are a frequent topic of conversation in the message boards. TWO WAY - There are two-way joysticks that only move left/right or up/down. Space Invaders is an example of a game that uses two-way joysticks. FOUR WAY - There are four-way joysticks that move left/right and up/down, but not diagonal. Pac Man is an example of a game that uses four-way joysticks. EIGHT WAY - There are eight-way joysticks that move in all four cardinal directions and the diagonals as well. Most space shoot-em-ups, like R-Type, use eight-way joysticks. OTHERS - There are also a variety of varients, such as the 49-way joystick. However, the bulk of joysticks are 4 or 8 way. You might think that you get the most versatility out of the 8-way joysticks, and for the most part you'd be right. However, there are some times that a 4-way is a better choice. For instance, in Donkey Kong, when you're trying to climb the ladder, you want to be able to go from moving right to moving up without hesitation as a flaming barrel tries to make your acquaintance. With a 4-way, if your timing is good this isn't hard. With an 8-way however, it's easy to accidentally hit the up/right diagonal when you're trying to move from right to up, leaving poor Mario standing still while the flaming barrel barbecues him. The same kind of reasoning applies with a 4-way in an 8-way game. See reviews page for a very brief comment on the 4-way vs 8-way from someone who purchased both. There are two primary styles of joysticks - the bat shaped handle, and the ball shaped handle. There's no technical differences between the two shapes, it's just a matter of preference. There are three types of switches that sit on the bottom of the joystick under the panel that send the actual signals to the game. The microswitch is a tiny pushbutton that's pressed when you move the stick, with an audible click. Leaf switches have two flat metal blades that contact each other when the bottom of the joystick pushes in that direction, with no audible sound. Finally there are optical joysticks that use optical encoders to determine which direction the joystick is pushing. Microswitches are the most common, but many people complain they do not feel as good as leaf switched joysticks, and they find the clicking distracting. Leaf switches are not made anymore, and are thus hard to find. Optical joysticks have the benefit of one less mechanical part to need maintenance/repair, a consideration with micro or leaf switches. Two options to interface to a PC: 1. Write a driver to remap these inputs as key inputs to an analog input (ouch)! 2. Do some PIC programming (with support logic) to make the digital inputs to an analog output that is suitable for the PC game port. Obviously, this is not an ideal joystick to use. There are at least two reviews on the reviews page proclaiming the ultimate is not the joystick to use. Review 1, review 2. Messages in the 9/10/99 message archive about super joysticks: 157, 358, 611, 629, 746, 819, 824, 939, 942. Misato-San: A common problem is that diagnol movements are not registered even close to consistently. On some cabinets they don't work at all. In any case, I was wondering how to fix this. matt(v): If you look at the microswitches you will see that there is a metal lever on it. If you bend the end of this lever outward on all four of the switches it makes the diagonals more responsive. You don't want to bend them too much or they get so responsive you can't move anywhere EXCEPT diagonals. Some comments from folks with 3/4" wood control panels that the shaft on the Super Joystick is a bit short. Suggestions have been to esponsive you can't move anywhere EXCEPT diagonals. Brian: I've got mine in a 3/4" particle board control panel, but in order to make them stick through the panel high enough I routered the area where the joysticks go until there was only .25" thick wood. This works great and I really like the height. I'm not worried about the heavy play breaking the wood since I've got plexiglass on the top too and that gives it even more strength. By most accounts, the Super-8 joysticks are the favorite joysticks to use. My cabinet will be using Happ Super-8 joysticks. Messages in the 9/10/99 message archive about rotary joysticks: 197, 199, 246, 247, a huge thread starting with 928, and 973. Happ Controls puts both the 12-position rotary switch joystick (50-5618-00) and optical rotary joystick (50-5619-00) under one category. They are, in fact, two separate products. This makes discussions on the joysticks a bit confusing. They accomplish similar goals - not only being able to move the joystick up/down, left/right, but also to be able to twist/rotate the joystick for games that require it (such as Ikari Warrior). The rotary switch accomplishes this via a 12 position rotary switch mounted underneath the regular joystick controls. The optical accomplishes this via an optical interface. Compare the two figures below. Several folks have reported great success interfacing the rotary switch joysticks to Druin's SNK LS-30 Rotary Joystick to MAME Interface. Happ Controls puts both the 12-position rotary switch joystick (50-5618-00) and optical rotary joystick (50-5619-00) under one category. They are, in fact, two separate products. This makes discussions on the joysticks a bit confusing. They accomplish similar goals - not only being able to move the joystick up/down, left/right, but also to be able to twist/rotate the joystick for games that require it (such as Ikari Warrior). The rotary switch accomplishes this via a 12 position rotary switch mounted underneath the regular joystick controls. The optical accomplishes this via an optical interface. Compare the two figures in the section above. It is extremely easy to set up, and only takes about 15-20 seconds to make all the necessary connections - the whole thing is plug-and-play. In conjunction with Optimame, This setup is incredibly cool. Two player, authentically controlled Heavy Barrel, in my home absolutely rocks! Marlin: Since it is controlled via optical sensors rather than microswitches, it only contains a single pin for the U/D/L/R directions, plus a pin for +5V and a ground pin. My question is, how do I wire the single pins to my keyboard matrix? Do I just solder both the + and - wires to the same pin? Ryan Osborn: I don't know exactly how the Perfect 360 sticks operate, but with only one lead per direction you'll end up seeing the individual leads go 'active' for their respective directions. This 'active' signal will either be high (~5 volts) or low (~0 volts). The JAMMA standard is for the leads to be pulled low, so I'd guess you'll normally see ~5 volts on each lead and then ~0 volts to indicate the direction. You'll need to use these active signals to drive a switch that will complete a circuit between two of your keyboard decoder's contacts. Go to the PC2JAMMA page and look through the plans. You'll find the circuit you need there (for active low). If the 360 provides a high active signal you can use the same circuit but leave out the inverter (7404). Ultimarc have a range of joysticks which have been designed with emulation in mind. They are made by the two top manufacturers of Arcade controls, but tailored to their specs. The main design brief was that for a true 4-8 way switchover, a mechanical restrictor plate is the only way to go, and this must be adjustable easily, for example through the coin door. Limit plates provide a true 4-way feel, rather than simply preventing two switches from being hit in the corners, (ie by reversing an actuator) because you can "slide" the stick across the diagonals. T-Stik is a small-angle high spring rate stick with a neat "toggle switch" 4-8 way changeover. J-Stik is a ball or oval-topped Japanese stick with a rotating 4-8 way limit plate. E-Stik (easy-mount) is a single-hole mount stick similar to the Happ universal but can be adjusted 4-8 way without undoing screws. Gaming Technology Xtreme put up a tutorial on how to build your own trigger grip arcade joystick from a Raider Pro flight stick and a Happ Controls Competition 4 way or 8 way joystick. Hack your own - One person on Dave’s Classics, Dale, purchased the mechanical parts to an arcade trackball (no electronics) for $10.00 from a junked machine. After cleaning it up, he had a fairly cheap device to hook up his electronics to. He hooked it up to an old mouse and it worked like a charm. Using two mice, "I took the optics out of one and attached them to pieces of circuit board and soldered leads back to the other mouse optics. I cut the circuit boards to fit where the original trakball circuit boards went." He is ordering new shafts and a mounting plate from HAPP, so it will cost a bit more than originally planned but still much cheaper than a brand new kit from HAPP. Other folks are intending to use a cue ball and the guts of a mouse to build their own, similar to the spinner design of Drew's (below). Happ Controls - Happ Controls sells a variety of genuine arcade trackballs, and a couple of interface kits (serial or USB) to hook it to your PC. These are a bit pricy, but by far the easiest way to go to get a genuine arcade trackball with a minimum of hacking. Hagstrom Electronics has a couple of keyboard encoders including the KE72 that include an interface for Happ trackballs (and others using the same standard interface). You can see pictures and a writeup on the KE72 page. Ultimarc makes an interface that also works with Happ Controls trackballs called the Opti-Pac that is inexpensive and has been very well received by the Build Your Own community. Happ Controls to mouse hack - Most efforts to interface trackballs and spinners have been via a mechanical hack to a mouse using the mouse optical pickups and electronics, or using a purchased interface. MAMEzilla instead hacked a Happ Controls trackball (and since they're the same optical interface, it will work for a Happ spinner as well) direct to the electronics of a mouse, requiring soldering but no mechanical hacks. Very cool. Kidsball - Stephan Hans found a stand alone trackball at the WORLD GREATEST COMPUTER AND INFORMATION TECHNOLOGY BUSINESS FAIR in Germany. 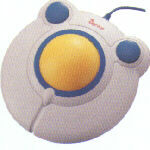 The trackball is from the Genius company (Kye corp.) and is called the KidsBall. The "KidsBall uses a huge 3 inch ball, and because the design of its case is relatively flat, it should be easy to dismount the top of the case and integrate the remaining core into an arcade console." (Quote from Stephan) It is expected to run around $40. Thanks for passing this on Stephan! David emailed me that he found the Kidsball at Buy.com for $20.95 (direct link). The nice surprise was that the Kidsball has a mouse pass-through port, meaning you can hook another pointing device up without a splitter! Thanks for passing this on David! Feedback on the Kidsball has been mixed - some folks are very happy with it, and others just didn't like it at all. Your milage may vary. CompUSA Crystal Trackball - The CompUSA Crystal Trackball is a wonderful PC trackball. I purchased two of them before I decided to go with a real arcade trackball from Happs. Even though they are not on my present cabinet design any longer, they very well may show up on a future panel. At any rate, they are cheap, glow red and green, and currently are being used on my 3 year old daughter's machine as a mouse. Highly recommended. Two folks have written up excellent how-to-hack guides on using this trackball on your cabinet/console. Andrew Bartmess did a very nice writeup on how he interfaced the trackball as part of his Tron's Game Grid arcade cabinet, and VoodooChile wrote up a tutorial on how he used the trackball in his Radical Arcade Cabinet. Excellent work by both, much appreciated! Crayola trackball - Got an email from Craig about another good trackball candidate, the "Micro Innovations Crayola Kids PC Trackball. The only difference is the color scheme. They are typically priced from $35-40. I have seen them for sale on amazon.com, outpost.com, and several for auction on ebay." Full product details can be found on their site. A guy named Dann emailed me that he had come up with plans for an "almost instant detachable wheel." Picture your arcade cabinet running all your games, and then pulling a steering wheel out of the coin door, hooking it up, and racing your brains out . . . Awesome! Dann says it took him roughly an hour to put this together! Here's the page! Cletus pointed out yet another site to me for building a steering wheel control. Lew's Wheels is an extremely detailed site, very well put together, great pictures. He has plans for wheels, shifters, pedals, clutches, etc. How deep into it do you want to get? :) Thanks Cletus! The SWC is not a spinner adapter, but rather constructed around a rigid housing and is a brand new design that was developed after studying different arcade steering wheels. The construction of this housing is heavier and more solid than the original arcade ones that were used as a model. Designed to fit a Happ Controls steering wheel with a 3-hole center cap. The SWC comes complete with housing, encoder, & mounting plate. It does not include a Happ Controls steering wheel. The Mini-Wheel is a natural finish all metal wheel. It is perfect for compact control panels or where space-saving is necessary. Check out their web site for more information! Star Wars type yokes The first yoke on the scene was the TwistyGrip build it yourself model. Twistygrip was purchased by CustomArcade, now defunct. The TwistyGrip originator has a web site you can visit for more information. More information on the TwistyGrip can also be found on our Alternatives page. Finally, Jude submitted an amazing writeup on hacking a genuine StarWars yoke and hooking it to a PC. Amazing!